Letter to Miss Anna W Hollenback from Martha Berry first saying that she was happy to hear of her recovery from illness. She mentions her gratitude in Hollenback thinking of the Berry students during this hard time in her life. She finishes by thanking her for her donation and inviting her to come down for a visit. 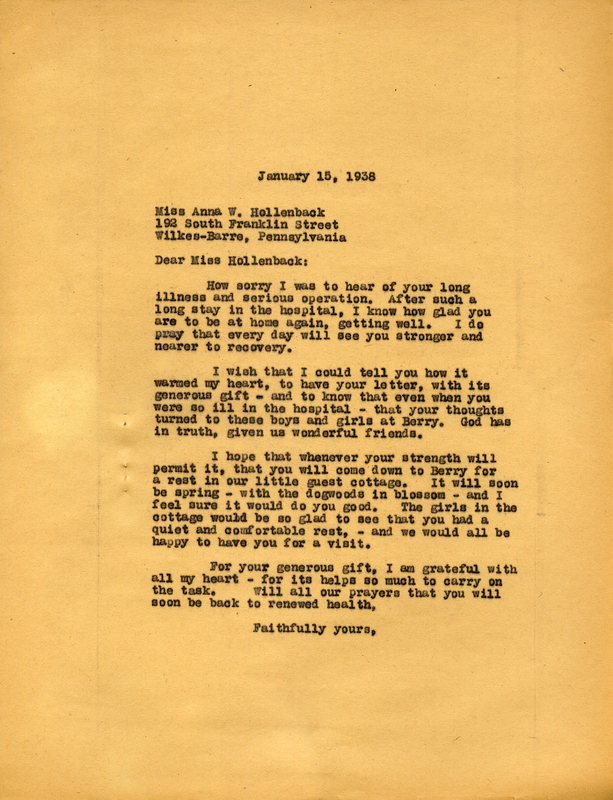 Miss Martha Berry, “Letter to Miss Anna W. Hollenback from Martha Berry.” Martha Berry Digital Archive. Eds. Schlitz, Stephanie A., Jessica Hornbuckle, Camille Hanner, et al. Mount Berry: Berry College, 2016. accessed April 21, 2019, https://mbda.berry.edu/items/show/14583.